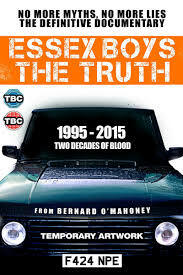 As the tagline on the box says 'no more myths, no more lies' this is the definitive documentary on the 'Essex Boys'. For over two decades the fate of 'Essex Boys' Tony Tucker, Pat Tate and Craig Rolfe's demise has been a case that has intrigued the public. For those that are unaware on the 7th December 1995 the British public woke up to the news that three men had been found dead in a Range Rover down a bridleway in Essex, the three men would later be named and the murders would later be known as the Rettendon Murders or better known as the 'Essex Boys' Range Rover murders.Now twenty years on former 'Essex Boys' firm member Bernard O' Mahoney peels back the truth on what led up to that day and the subsequent fallout. Full of interviews and memories from family members, this documentary will leave you remembering that day as if it was only yesterday. Only for those that are interested in the 'Essex Boys or British gangster culture itself.